THERE ARE A LOT OF NOSEY PEOPLE HERE. This is one hell of a kiln. See more by clicking. We travelled to Grasse the capital of the French perfume industry. All the great French perfumes are concocted here. I wasn’t expecting little shops with ladies in traditional local outfits making the perfumes by crushing flowers, mixing alcohol and adding a little fat or something else but I wasn’t prepared for what greeted us. Basically each perfume company manufactures perfumes on an industrial scale with buildings the size of 6 Metro stores and a mini refinery like cracking plant in the rear that is where the distilling process occurs. The air is pungent with sweet smells. Some are identifiable like lavender or lilac most I can only associate with some girl I went out with. We stopped at Fragamond the top perfume house. We were ushered into a showroom area with ancient stills, a panel showing where the various ingredients come from and a hostess to give us an English tour. Our guide was a Chinese lady with spoke quickly with a sharp chopped accent that made most of what she said unintelligible. She was a classic no expression on the face oriental. We passed a lab with a lot chemistry like bottles of various colours and glass tubing that look like Rubick had designed them and several small production lines where ladies were filling bottles placing them in fancy boxes then a larger carton for shipment. The next station had a man using a machine to make soap bars through squashing loose soap pellets into a fancy bars of soap. We then exited to the showroom with 101 different kinds of perfume and told if we bought in bulk we could obtain a 20% discount. The discount started at 5 items and that ran you a minimum $100. What was missed was any attempt to tell you how perfume is made. No PowerPoint demonstration. No literature. Nothing. No stories about how you train your nose to work in the business, how many tons of rose petals does it take to make 1 oz of essence. I know the secret like coca cola must be kept from the hoi polai if that is how you spell it. 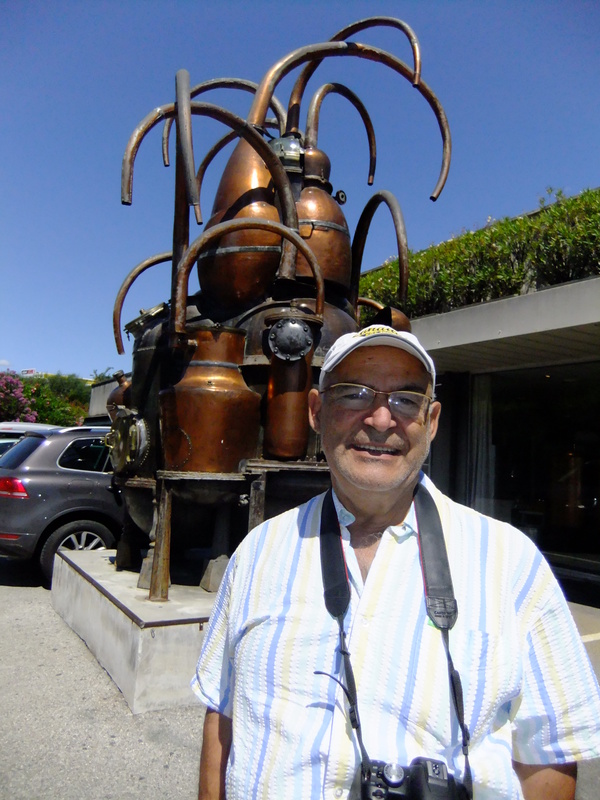 It was like I took you on one of my tours to the Distillery and showed you a bottle of whiskey and nothing of the process of fermentation, distilling or the ingredients that go into making booze. You were there to simply consume their product because it would allow you to be accepted and find a mate, and they laugh at Voodoo methods. Elizabeth bought some gift items but didn’t succumb to spending her next month’s income of 2 ozs of perfume. We decided on not visiting any other industrial perfume plants and sought out old Grasse. As in all these areas there is the old town quite charming and we had lunch in the main square by the fountain. Again the food wasn’t that great and at this point I am wondering maybe Pizza Pizza or McDonalds ain’t that bad. We left Grasse and headed back to Cannes. It is 15 km but winding through hilly terrain and stopping for a view of the Mediterranean from the hills of Grasse made the trip longer then we thought.